It’s Link in stained-glass designs… on a frosted pint glass! After a long day of battling Ganon and protecting the land of Hyrule, Link loves to put his feet up and have a relaxing drink (we’re just assuming). And, when he does, he drinks from his special glass. 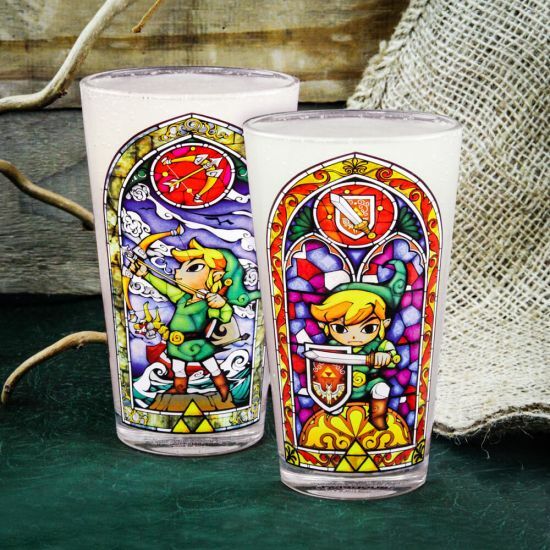 So, if you have the Spirit of the Hero, just like our Link, then you need Link’s Glass, too! This glass looks like it comes straight from the land of Hyrule, and it holds almost as much liquid as you’ll find in the Great Sea… OK, maybe a little less, but it holds a deluge of 400 ml! It features 2 stained-glass designs, each featuring Link in different poses. On the front (or back, depending on how you look at it) you’ll find Link with his sword and shield, while the reverse side gives you Link with Zelda’s bow. This glass is sturdy enough to have come from one of Hyrule’s greatest glass-blowers. But, it doesn’t have anything like Link’s Power Bracelet to protect it in the violent lands that we call the dishwasher. So, go medieval on this glass and wash and wash it by hand. If you search for Zelda merch with the same commitment that Link searches for his sister in the Wind Waker, then Link’s Glass is definitely for you!